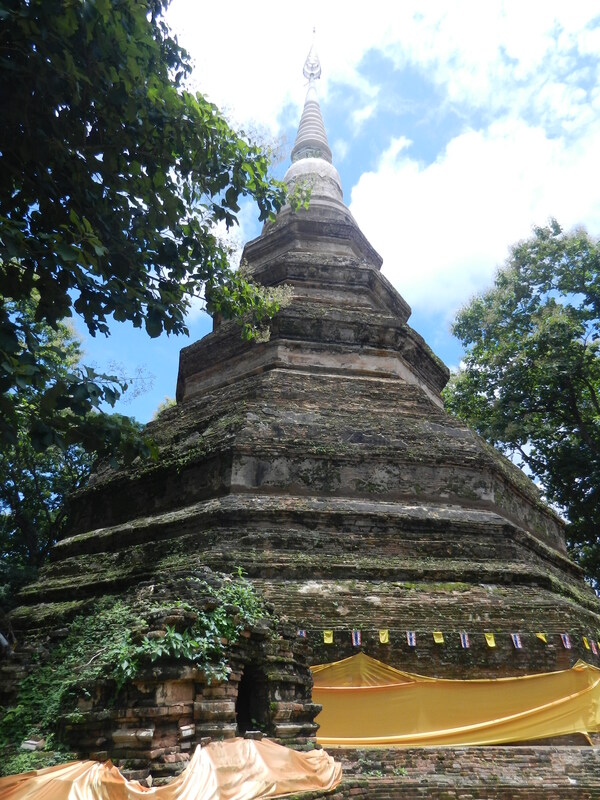 The historic northern Thai town of Chiang Saen is full of ancient Buddhist monuments, but Wat Phra That Chedi Luang is its principle shrine. People from all walks of life still pay their respects there. 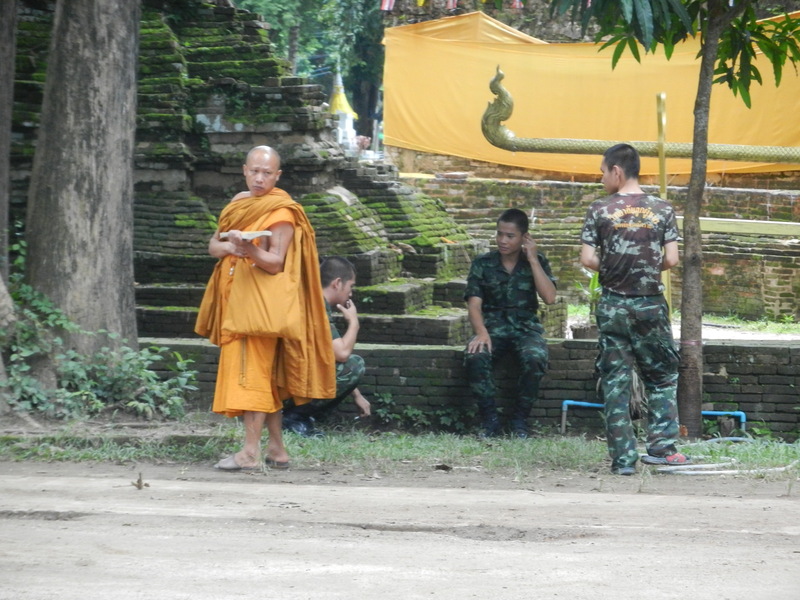 About 200 soldiers on a break shared the grounds with monks. 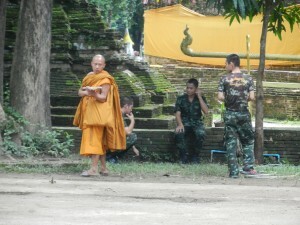 Their garb differed, but all were disciplined young men quietly ambling around the temple. 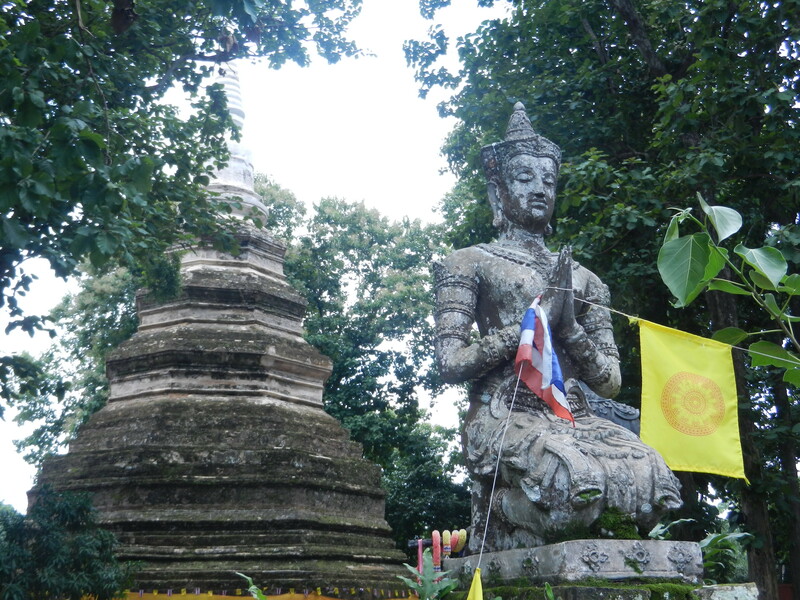 The temples in Chiang Saen represent a different way of encouraging people to cohere than the Athenian Agora in the last post–and a real cool intercultural comparison. 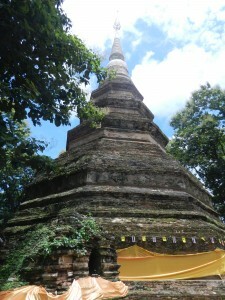 Wat Chedi Luang and Chiang Saen‘s other temples represent a different way of ordering the world than the linear relationships that Athens’ Agora did. Wat Chedi Luang ‘s lower section’s an octagon, but the shrine’s entire form looks less like a static geometric shape and more like a flow of energy from the heavens. It ripples like a river, as though grace is cascading from the sky in the form of the waterways that Thais have lived and migrated along for more than 2,000 years. The rippling seemed even more real as I walked around the stupa. Statues of devotees like the one in the above photo line the top of a fence around the stupa. The statues and stupa gently blend with the trees in the background. Ancient Athens’ Agora was an open field with buildings around its borders. Their colonnades are in straight lines. These linear relationships and the free interactions between people within clear sight of each other encouraged assumptions that the world is unified by linear relationships between distinct entities. Many modern Western scientists still hold this assumption. But Thailand’s rivers, flowing art-forms and profuse vegetation blend so that things aren’t distinguished so sharply. Everything flows together. Graceful art and personal etiquette encourage society to cohere. Thais were rarely as direct as the folks I met in Greece, but their landscape is so full of enchantments that you don’t need the probing conversations with others to be happy. We’ve only seen a small percentage of Chiang Saen‘s beauty. We’ll explore more of Chiang Saen’s grace in the next post. If you’re very Greek, be careful or you might lose your bearings. What a fascinating website. It’s so nice to learn about other cultures through those that have the opportunity to travel. Thanks for the compliment, Pam. Thailand’s one of the most fascinating cultures in the world.